Phil's Forum for Independent Retailer Success: Which Topic Next? I recently published three Free eBooks on my website - Inventory Management, How Ads Work Part 1, and How Ads Work Part 2. I have two more eBooks I'm working on, but not sure if I have the time to get both done. Which would you prefer first? One title is Marketing a Retail Store on a Shoestring Budget. 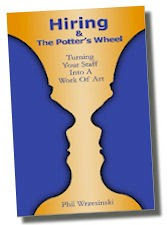 It is similar to the non-profit eBook of a similar name, but with a couple distinctly retail-oriented changes. But I've done a lot of writing on advertising lately and not sure the motivation is there (unless you tell me that is what you want). The second title is Merchandising Made Memorable. The goal of this eBook is to give you some tried and true rules on merchandising including plenty of examples of do's and don'ts. Plus, there will be a couple ways to break all the rules all the way to the bank. Just like Pricing for Profit, I look at merchandising from a customer's standpoint. And you should, too. So those are the options... Let me know in the comments which one you want to see first.